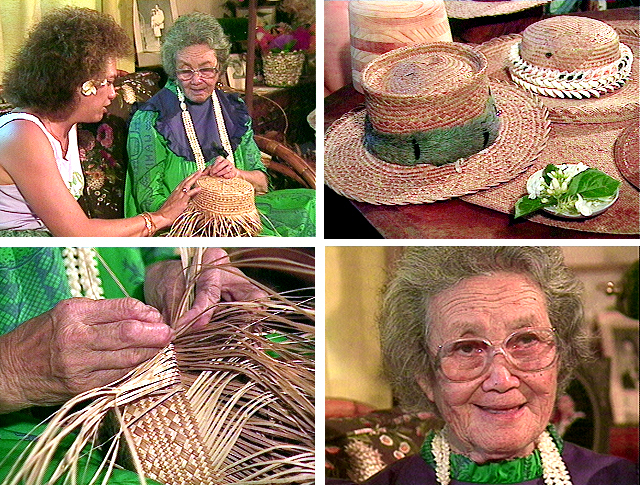 Tuti Kanahele visits Esther Makuaole who makes her home on Kaua‘i. Following a long-established tradition taught to her as a young girl in Kona, Esther skillfully weaves pāpale (hats) made of lau hala and other materials. The exquisite beauty of her work is revealed as she demonstrates the tools and the styles of weaving. Videotaped July 31, 1990 at Waimea, Kaua‘i. Nā Hulu Kūpuna is a series of video portraits featuring Hawaiians of the kupuna (grandparent) generation sharing knowledge and stories in their native language. In Hawaiian language; no English subtitles. Produced in association with ‘Aha Pūnana Leo. Sales tax applies to Hawai'i residents only. Proceed to checkout and enter your billing address to view actual charges.